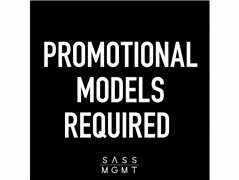 We have a high volume of promotional work coming through the agency and have decided to open up our books for new promotional talent to be apart of our team. Our promotional team do not hold an exclusive contract - so this means of you are signed to other agencies you are able to still work with our promotional team. Our services are conducted at a very high caliber and we expect our staff to conduct and represent themselves to this standard.